Recently I saw a card...somewhere (we will talk about that in a minute) and it sold me on this stamp set and immediately I had to have it but since I knew it wouldn't be a mainstay in my stamping repertoire I wanted it for FREE or at least a discount. So when Stampin' Up! said that I got a discount for my birthday I scooped this set up immediately! 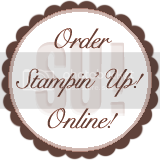 (Do you want a discount from Stampin' Up! for your birthday? Join my Create With M.E. team today!) Here is my version of the card I think I saw because I can't find the card I really saw anywhere and I'm starting to think I just dreamed about it. We are going to duplicate it tonight at my Forget-Me-Not card keeper class in Villa Grove. Still room to join M.E.! Email M.E. now! I really do love Pinterest don't you? I think this time though Pinterest took advantage of me! LOL I have spent a lot of time looking on my boards and even other stampers boards to find the card that drew me to this stamp set in the first place. First so I could refresh my memory on the card and secondly to give credit. Darn if I can't find it anywhere. I think my version that was hazy in my head turned out pretty good! Do you love the Beach and have to have this set now or just love this card? Order the By the Tide set today because it's in the spring catalog and will be gone soon! Click on the number below to go to my store to have it shipped right to your door.